The Angriest: Star Trek: The Next Generation: "Code of Honor"
In "Code of Honor", Lieutenant Yar is kidnapped by the leader of Ligon II and invited to become his number #1 wife. This leads his existing wife to challenge Yar in a duel to the death, because women fighting to the death over their patriarchal masters is what Star Trek is all about, right? Right? 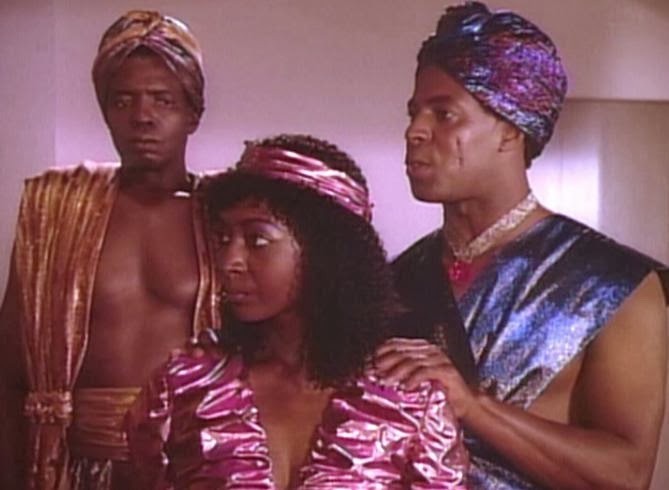 Oh, and all of the Ligonians are played by African Americans. Sure it might look dodgy to have all of the violent, warlike and comparatively primitive people be black, but I'm sure it's not that racist. It doesn't even look racist. Does it? Really? "Code of Honor" is an epsiode that moves from the bland awfulness of the first two episode and enters into its own brave new world of racist, sexist, and deeply unlikeable trash. Nobody likes this episode. Not audiences at the time, not fans, not the cast, not the crew. The original director, who was responsible for casting the Ligonians as Africans, was fired before the shoot was complete. It's a pity he wasn't fired before the shoot began. This is Star Trek at its worst: not just incompetently written and produced, but quite difficult to sit through and a direct refutation of everything nice that the original series stood for. It's not just that the Ligonians are played by black actors. They all speak with cod-African accents. The men are all repulsively over-sexualised. They all have ritual facial scarring. They speak in terms of magic and superstition ('...my code of honour protects me like a magic cloak.'). It's just... I'm actually a little lost for words here. This is 1987. They should not be broadcasting stuff like this on American television. They weren't even broadcasting stuff this bad back in 1967. On top of all the offensive bits is some awful dialogue and plotting. It's just one tedious moment after another, with the only real moment of action is cribbed directly from the original Star Trek's "Amok Time". The episode focuses on Tasha Yar, and it lets both the character and the actress (Denise Crosby) down terribly. No wonder she quit before the end of the season; I'd have walked off before the end of this episode. Three episodes in and they've all been uniformly awful - and now they're getting oddly offensive too. How the hell did this series last for seven seasons with a start like this? How did it make it to the end of its first?